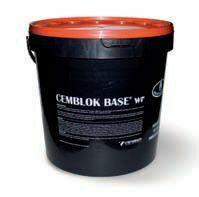 Encapsulating, concentrated, water-resistant product used to remove materials containing asbestos. Encapsulating Type D, according to the 20/08/1999 regulations. Encapsulating to be used when high and longlasting resistance to seasonal changes is requiredx or for wide surfaces. Auxiliary encapsulating product for asbestos removing opearations. Dilutable 50% max, it is spraytable also with non professional pumps, very colourful and water-based tracer. It has a low viscosity. Certified according to the security rules.